According to a report released today by the U.S. Census Bureau, the number of uninsured Americans under age 65 rose from 45.7 million in 2008 to 50.0 million in 2009. The overall rates for the entire population reached 50.7 million in 2009. While this country was already in a recession in 2008, the economy sharply deteriorated in 2009. The unemployment rate increased from 5.8% to 9.3% between 2008 and 2009, the largest one-year increase on record. As most Americans, particularly those under 65 years old, rely on health insurance through the workplace, it is no surprise that employer-sponsored health insurance fell precipitously from 2008 to 2009. Employment-based coverage for the under 65 continued to erode for the ninth year in a row, falling 3.0 percentage points from 61.9% in 2008 to 58.9% in 2009. In 2009, 50.0 million people under 65 were uninsured, up 4.3 million since 2008. The number of uninsured non-elderly Americans is 11.8 million higher than is was in 2000. The share of non-elderly Americans with employer-sponsored health insurance declined for the ninth year in a row, down from 61.9% in 2008 to 58.9% in 2009, a total decline of 9.4 percentage points since 2000. The only reason why the drop in employer-sponsored insurance (ESI) did not translate into an even larger increase in the total share uninsured is because 4.9 million more people under 65 were covered by Medicaid/SCHIP in 2009. Unfortunately, the number without ESI, and thus without any insurance, is likely to swell in 2010 and 2011 as the unemployment rate is expected to continue to rise. Critical provisions in the Recovery Act mitigated the damage by subsidizing COBRA and helping to shore up Medicaid funding. Employer-sponsored health insurance remains the predominant form of coverage for those under 65 years old. 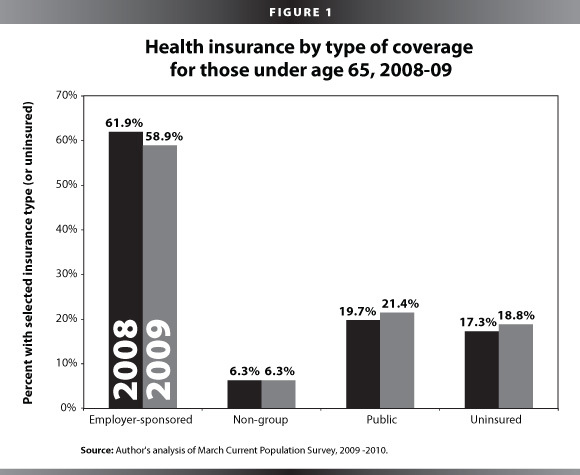 In 2009, however, the rate of coverage fell over the year (as shown in Figure 1). Non-group coverage remained flat over the period while public coverage rose significantly from 19.7% in 2008 to 21.4% in 2009. It is this increase in the percent of Americans covered by public insurance that has kept the share of Americans without insurance from rising faster in 2009 as ESI fell. The Census report suggests evidence of further unraveling of the employer-based system as the share of persons covered through work (either their own or a family member’s employer) declined for the ninth year in a row. 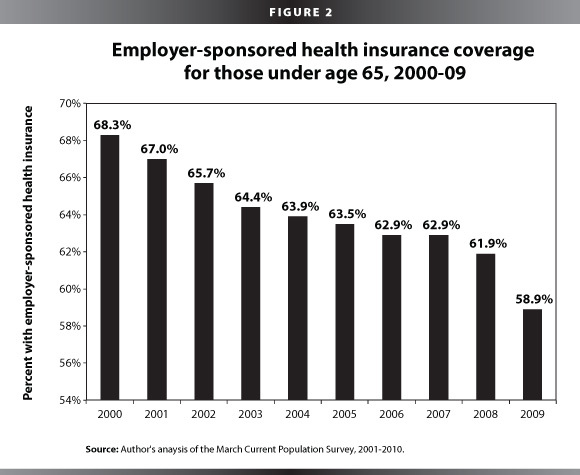 As shown in Figure 2, employer-sponsored health insurance covered 58.9% of people under age 65 in 2009, down from 61.9% in 2008, and a total decline of 9.4 percentage points since 2000. ESI coverage for children continued its unabated decline, falling again between 2008 and 2009, from 58.9% to 55.8%. Children coverage through the employment-based system has fallen 10.1 percentage points since 2000. The share of uninsured children did not statistically change over the last year, however, as their Medcaid/SCHIP rates continued to rise, jumping from 30.3% in 2008 to 33.8% in 2009. While children have been shielded from the declines in ESI through public insurance increases, non-elderly adults have not been so fortunate. The 18-64-year-old population experienced a statistically significant increase in the share uninsured from 20.3% to 22.3%, an increase of 4.1 million uninsured adults. Workers experienced a significant decline in coverage as well, an increase of nearly 1.5 million more uninsured workers. One of the clearest indicators of the deepening recession is the unemployment rate. In 2007, the most recent peak year, the unemployment rate was 4.6%. 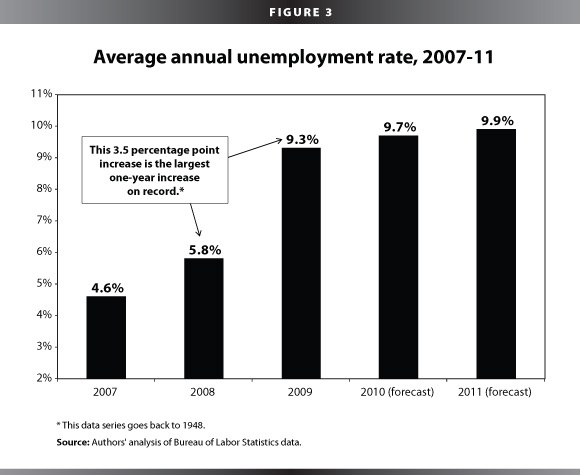 As shown in Figure 3, average unemployment rose modestly to 5.8% in 2008 then jumped 3.5 percentage points to 9.3% in 2009. While the largest increase in the unemployment rate for this recession has already been felt, the unemployment rate is forecasted to increase to 9.7% in 2010 and 9.9% in 2011. While employer-sponsored health insurance remains the predominant form of health coverage for the under-65 population, it is often the case that when people lose their jobs, they lose access to their health insurance. Therefore, it can be expected that the ESI coverage could drop another 0.5 percentage points by 2011 to nearly 58.4%. While not one-for-one, a drop in ESI coverage is strongly associated with a rise in the number of uninsured Americans, only lessened by increases in public coverage (particularly among children). By 2011, it is likely that the number of nonelderly uninsured will increase by another half million. One factor that may have stifled the erosion of health insurance coverage even with such a high unemployment rate is COBRA. COBRA coverage, which allows unemployed workers to keep their employer-sponsored health insurance from 18-36 months as long as they pay their premiums, was expanded as part of the American Recovery and Reinvestment Act (ARRA). Previously, people who participated in COBRA had to pay up to 102% of the costs of the premiums. Under ARRA, workers received a subsidy for 65% of the premiums if they lost their jobs between September 2008 and December 2009. Although data on COBRA eligibility and uptake is difficult to measure, early reports suggest that uptake increased significantly with the help of the subsidy. The Commonwealth Fund, using data from Hewitt Associates, estimate the COBRA take up doubled under ARRA from 19% before the subsidy to 38% after. That finding is on par with a report from the U.S. Treasury department that looked at people receiving unemployment benefits in New Jersey. They found the take up rate to be anywhere from 29-32% among eligible UI recipients. ARRA also included about $140 billion in aid to states to lessen the need for states to make cuts to services, cuts in spending, or increases in state and local taxes. A large percentage of the funds that went to states was in the form of increased Medicaid funding to reduce the extent and severity of cuts to that program. While it is impossible to know what would have occurred had states not received recovery act funds, it is clear that those funds did help maintain and increase Medicaid coverage. In short, there is emerging evidence that ARRA was successful in stemming the tide of the uninsured from the current recession. d to worsen in the near future. Phase-in of the Patient Protection and Affordable Care Act (health reform) over the next few years is expected to stem any additional losses and reverse the current trend, covering millions more Americans. Using methodology from Holahan, John, and A. Bowen Garrett. 2009. Rising Unemployment, Medicaid and the Uninsured. Washington, D.C.: Kaiser Family Foundation. Using methodology from Gruber, Jonathan and Larry Levitt. 2002. Rising Unemployment and the Uninsured. Washington, D.C.: Kaiser Family Foundation. Bovbjerg, Randall R., Dorn, Stan, Macri, Juliana, and Jack A. Meyer. 2009. “Cobra Subsidies for Laid-Off Workers: An initial Report Card.” The Commonwealth Fund: pub. 1358 vol. 75, Washington, D.C.
 U.S. Treasury Department. 2010. “Cobra Insurance Coverage Since the Recovery Act: Results from New Survey Data.” Office of Economic Policy. http://www.ustreas.gov/offices/economic-policy/cobra%20final%20report.pdf.